A pick-up truck crept past as Jeremy and Tracie Parzen waited for fellow protesters to show up for a rally against a new Confederate monument in Orange, Texas, on November 10. “F*** y’all,” the truck’s driver screamed before slamming on the gas pedal and rumbling away. Having been cursed at by motorists in the past, Jeremy and Tracie did not initially pay the incident much mind. But the driver circled the truck back around, parked in a petrol station and approached them, hollering as he neared. Sensing trouble, Tracie pulled out her telephone and started filming. Although the incident passed without physical violence, the man’s nearly two-minute, profanity-laced tirade came on the heels of a wave of intimidation, harassment and attacks during recent anti-Confederate monument rallies. In recent years, harassment has become commonplace during protests against Confederate monuments, with threats levied and brawls breaking out at rallies in Texas, North Carolina, Louisiana, Virginia and elsewhere. On August 12, 2017, white nationalists from across the country descended on Charlottesville, Virginia, for Unite the Right, a rally staged to oppose the city’s decision to remove a statue of Confederate leader Robert E Lee. As participants attacked counterprotesters and community members throughout the city, James Alex Fields Jr slammed his car into a crowd, killing 32-year-old Heather Heyer and injuring dozens. Earlier this year, in August, a Confederate flag-toting man punched a protester in the face in front of the Silent Sam statue at the University of North Carolina – Chapel Hill. On May 7, 2017, white nationalists arrived at the Robert E Lee statue in New Orleans, Louisiana, wearing body armour, masks, and helmets, and carrying sticks, pepper spray, and guns. Brawls erupted and at least three people were arrested, local media reported. 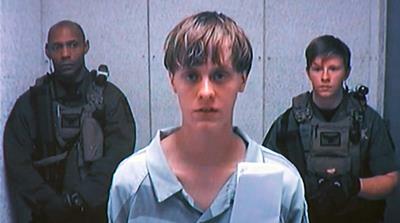 After white nationalist Dylann Roof shot dead nine African American worshippers in a Charleston church in June 2015, photos of the killer posing with a Confederate flag emerged online. Roof’s massacre prompted nationwide rallies calling for Confederate symbols to be removed from public spaces. Pro-Confederate have held their own rallies in support of preserving the memorials; they argue that removing monuments and statues erases history. The Southern Poverty Law Center (SPLC), an Alabama-based watchdog, has documented the removal of at least 110 Confederate memorials in 22 states since Roof’s deadly rampage. 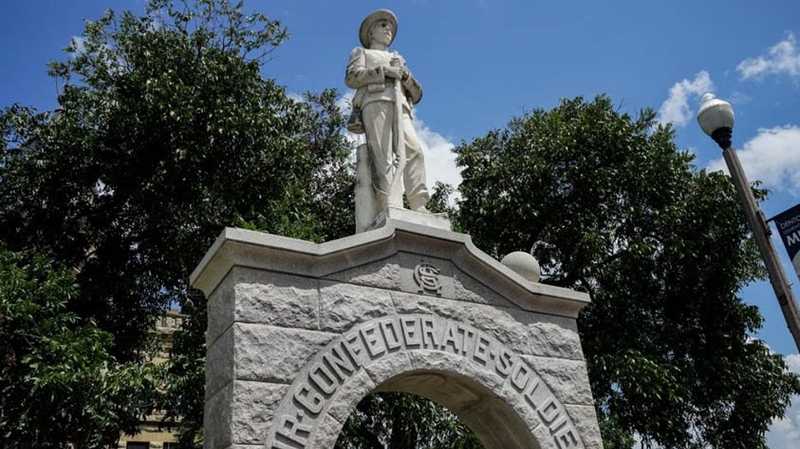 But at least 1,728 Confederate memorials – among them 772 monuments – remained intact as of June 2018, the SPLC found. As the monuments grew into flashpoints for violence and protest across the South, research suggested that one’s view of Confederate iconography largely depends on race. Based on 1,000 respondents, a recent Winthrop University Southern Focus survey found that 58 percent of African American view Confederate symbols “unfavourably”, while a majority of white people say they represent “Southern pride”. The first protests kicked off in Orange, Texas in December 2017. Three months after Unite the Right, the first Confederate flags were raised on the unfinished memorial. During the more than subsequent eight rallies held by the Repurpose Memorial group, motorists have occasionally cursed at the protesters, and some have exited their vehicles to argue with demonstrators, including the Parzens. His demeanour growing more aggressive, the man called them “stupid sons of b******” and “dumb*** Democrats” who are destroying “America’s heritage”. Funded by the Sons of Confederate Veterans (SCV), the monument remains unfinished. But travellers passing through Orange on the I-10 freeway are greeted by its 13 columns, one for each Confederate state, and 32 flags, one for each Texas-based Civil War unit. 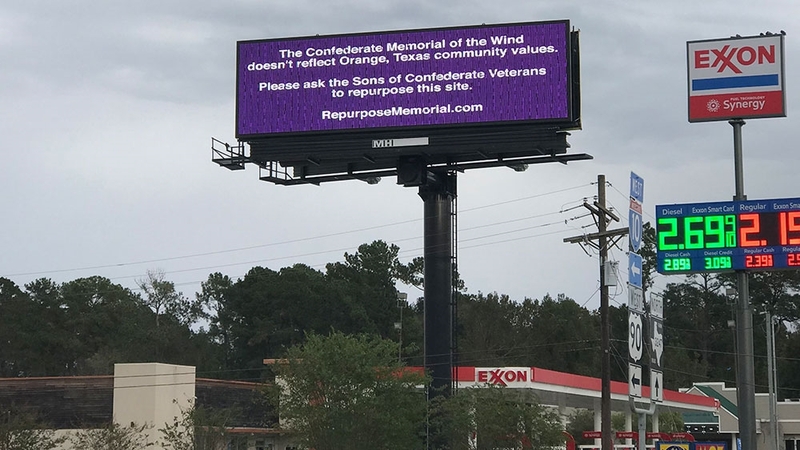 Located on Martin Luther King Jr Drive, the monument brews controversy in the 18,500-person community: the local chamber of commerce asked its owners to consider abandoning the project, and the city passed an ordinance limiting the height of flagpoles not owned by the local government. But the city cannot simply remove the monument – it sits on private land – and city officials have little recourse to act beyond passing non-binding resolutions. “The best way to put it is that they’re (SCV) holding the city hostage,” Jeremy Parzen said. Despite the harassment, anti-monument protesters in Orange are planning to continue their rallies. 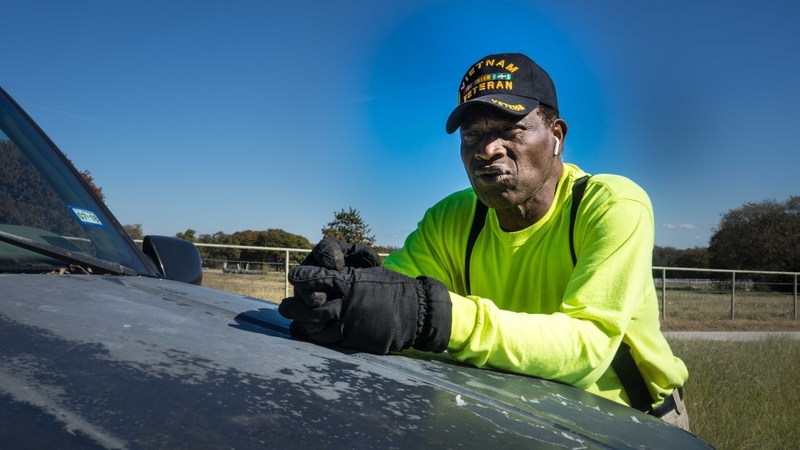 Some 560km away from Orange, in Denton, Texas, 73-year-old Willie Hudspeth has encountered threats and intimidation time and again while protesting the local Confederate monument. Since 1999, Hudspeth has held protests in front of the monument, a grey stone arch sitting in front of Denton’s historic courthouse. Passersby have often shouted at him, sometimes hurled racist slurs at him, and issued vaguely-worded threats. But the threats escalated when Hudspeth, who is also the president of the local NAACP chapter, found himself leading a resurgent protest movement against the monument after the 2015 Charleston church massacre. Five weeks after the bloodshed in Charleston, on July 20, 2015, Hudspeth stood under the shade of the monument. He stared back at a black AR-15, dangling from the shoulder of university student Stephen Slade Passariello. The incident, recorded by a bystander, prompted outrage on local news outlets and on social media. Facebook users dug up a comment in which Passariello exclaimed his readiness to “get the f***ing lynch ropes out”. But as Passariello confronted him, Hudspeth remained vigilant. Even as his fellow protesters backed away, he moved closer to his detractor. “I knew if I’m right here [close] on him, he can’t do anything,” he told Al Jazeera. “And I knew exactly how to take him down: I was going to kick him in the nuts,” he added, punting his leg into the air to mimic the motion. The standoff ended without a confrontation, but Hudspeth saw in it cause for celebration. “It really helped our cause,” he said, pointing to increased support in the wake of the incident. Hudspeth has since kept up his protests, lobbied local officials and continued to call for action on the Confederate monument. The new county judge, Andy Eads, has promised to continue studying the plumbing beneath the town square in order to decipher whether a pair of fountains on the monument were ever hooked up to running water. Hudspeth says the fountains were whites-only, while supporters of the monument argue that the fountains were never hooked up to the underground water pipes. And in nearby Pilot Point, Hudspeth and other volunteers gather each week to clean up a long-abandoned African American cemetery.